Officiating at the commissioning of St. Elizabeth Chapel at Kyebambe Girls School in Kabarole District. Rwenzori Diocese Bishop Reuben Kisembo has asked President Museveni to disregard the amendment of the Constitution and retire. 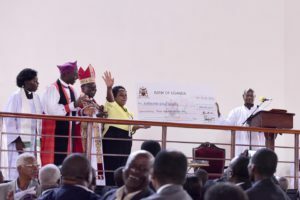 Bishop Kisembo was speaking during the long-awaited commissioning of the construction of the multi-million dollar Buhinga Stadium in Kabarole District earlier today (Saturday). “Mr President, we know the Constitution has been amended to enable you to stay in office beyond 2021. 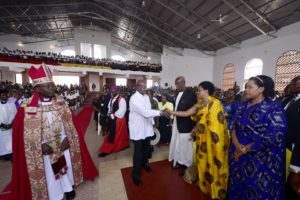 But it is not too late for you to consider retiring in 2021 for the good of the country and for your own good and health,” Bishop Kisembo said. The President this afternoon laid the foundation stone for the sports facility which is estimated to cost Sh11 Billion. In his response, President Museveni asked the cleric to have discpline in the way he addresses issues, adding that he was at the function for a different purpose. “The religious leaders have been provoking us and me in particular, it should stop. I don’t want people to lecture me about what to do for Uganda. A person who wants to lecture me must have the qualifications,” Museveni said. “There is time for everything, I have come for a fundraising. There should be a disciplined way of interacting,” Museveni, who also attended the commissioning of a new school chapel at Kyebambe Girls School, said. President Museveni greets Tooro Queen Mother Best Kemigisa. 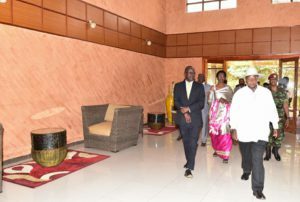 The President also launched the Kalya Courts Hotel and Rwenzori Region Tourism Information centre which facility is hoped to reinforce efforts to improve the tourism sector.. According to the stadium construction plan, a perimeter wall will be constructed around the stadium. Contrary to the original plan, the stadium will seat 10,000 people instead of 30,000. The stadium will have a pavilion, dressing rooms and toilets. The district believes that once the facility is complete, it will generate more revenue through bookings and gate collections during sports events. For many years, Kabarole District was soliciting funds to construct the stadium in vain. About Shs35 million that had been raised in 2009, was diverted to pay district debts. In 2012, the district received Shs800m from government to start constructing the said stadiu, however, since then, the President has just laid the first stone. Once construction has started, Boma, Bukwali and St. Leos’ College playgrounds will be used as alternative venues for sports activities. Four days ago, Museveni was in Burahya County in Kabarole where he attended the 83rd birthday celebration of Constance Kabakaali Muhangazima Adyeeri a wife to the late Phillip Muhangazima and a mother to Margaret Muhanga and outspoken journalist Andrew Mwenda. President Museveni is taken around Kalya Courts Hotel which he commissioned in Kabarole earlier today.